Welcome to the Top Ten Luxury Home Showcase. Here you can view the Best Luxury Homes for Sale in Central Florida including Luxury Golf Course Homes, Luxury Waterfront Properties, Guard Gated Homes, Million Dollar Luxury Homes, Mega Mansions and more! 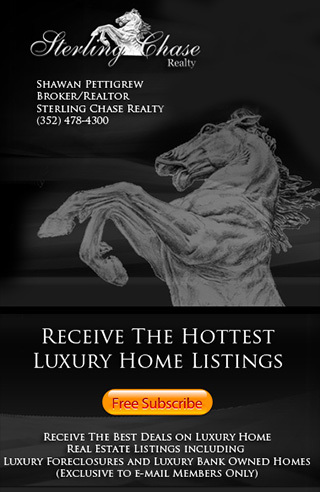 We also feature The Best Luxury Foreclosure Deals in all of these Home Communities including Luxury Foreclosures, Bank Owned Properties, Short Sale Lisitngs and Below Market Offered Homes for Sale If you have any questions about these communities or just need help in finding the perfect home, please call us at 352-360-3994.